BT has officially unveiled its first fibre optic offering, with BT Infinity super>fast boasting download speeds of up to 40Mbps from £19.99 per month. 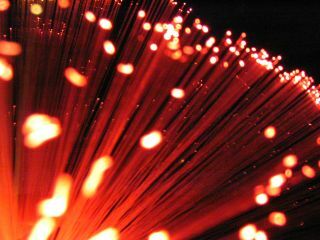 In a release that talks about Virgin Media's rival superfast broadband as much as its own in the opening few sentences, BT points out that its fibre to the cabinet (FTTC) is available for £7.47 less a month than the Virgin's flagship service. Of course there is no mention of the 50Mbps speed of its rival, neither does the release make a big point of the fact that the £19.99 BT Infinity package is only available if you fork out a £50 connection fee until a graph at the end - and it's capped. The laudable 10Mbps upload speed is only available on a pricier £25 package, complete with free install - a package that nonetheless looks like the better value of the two. "BT Infinity will transform consumer experience of the internet, benefiting all internet users," says BT's release. "Households with multiple computers/internet devices will enjoy simultaneous use of services such as HD catch-up TV, social networking and the sharing of photos or films, amongst others." BT Retail started to sell fibre services to other providers last week with its Next Generation access programme – part of a £1.5 billion investment in upgrading the UK's infrastructure. The £19.99 package is available for those who pay a £50 connection charge and this option comes with just a 2Mbps upload speed. The £25 package has the aforementioned up to 10Mbps upload speeds. Gavin Patterson, Chief Executive Officer, BT Retail, said: "The internet is essential to our customers' lives and they are demanding more and more as richer and even more compelling services become available. "BT Infinity gives customers the capacity and reliability they need in an instant and at a great value price they can afford. "We want to give our customers the best possible online experience and are committed to rolling out super-fast speeds across the UK." From January 25, new and existing BT Total Broadband and BT Business customers in an enabled exchange areas will automatically be eligible for the up to 40 Mb/s broadband service. That doesn't mean you'll be getting BT Infinity from January 25 - 'the service will be made available to 4 million homes and businesses by the end of December 2010' adds BT. So you'll have to be lucky to get it this month.